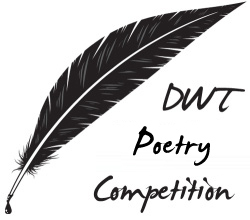 All right folks, it is time to kick start the first DWT Poetry Competition. The response from our readers was fantastic, with over 150 entries! Given this number we’ll have two qualifying rounds every week. The first one on Tuesdays, and the second one on Thursdays. The voting on each round will be open for 48 hours, and the poem with the highest number of votes goes to the semi-final, to be held at the end. If you are an email or RSS subscriber you’ll need to visit the website to cast your vote (just click on the title of this post). Now to the first ten poems. Enjoy! What road is this of stone and strife? What pain has built can hearts ignite? Love is here then it is gone. We curse the lost forever,alone. Give me a taste of happier days gone by. You took my love, forever,was your word. My heart is cold my feet are stone. My bed no comfort when I am alone. they are bitter, broken and of no use. is miles and miles of pain and dark. Where does love grow when no ground will sooth? Where does the heart put down new roots? My heart is breaking no love I see. My body will not give up their memory. The spirit fumbles to rise and praise. This road is endless both night or day. That rose you left for me to see. The one just barely surviving by our tree. It spoke to me this empty morn. It said your name and bowed forlorn . I stopped to hear more it would say. I wandered close, had my sanity strayed? Could this tender flower know more then I? More then me, of higher mind and power. Again the breeze went by and sighed. The trees bowed too at the knowing flower. Beauty it breathed and its love I felt. No form, no kiss, but passion of an ilk. Love grows here by my old oak tree. Love grows where you want it to be. The road we chose was meant for two. is the one left for mourners to walk. Love does not die but lets us grieve. Love lives and heals,a blessed reprieve. My eyes were shut out from vision of fear. I had an aversion for sin. Seemed to conciliate all to be found. What could this vociferation be? Could it not be converting me? For as it was, I couldn’t see. Seemed as though to whisper a word of love. Please, Please, be still.. Look unto the horizon- see yourself the Beauty the still. Or maybe right or left the dipper will leave you with nothing left. Either way flipping it gets you around. The your life is very compelling. The flipper dips in your life and turns it into a dream. Ones goal in life is but to flip it on the dipper. It was the flipping on the dipper that brought him to rest. Flipping it on the dipper can leave you with all thumbs. Really that’s all right as long as you put up a FIGHT FIGHT FIGHT!!! Just remember one thing, when you are in trouble do what my friend and I do. Stay true to the dipper. knock tick-tock a cocking load. When I asked you to be near? When you hide them behind your ribs. His first steps in Art. When your words are rough. From Mom and Dad has run. The second line starts with “the” but is more likely “that”. I enjoyed your word choices in The Firmament. I cannot believe that all of these poems were submitted centre-justified. So why did you post them this way? Any good poet knows that the way the poem looks on the page is part of the experience of reading it. Makes me thankful I didn’t submit any of my own poetry. @ Peter. I wondered that myself. It works well for Flipping it on the Dipper, makes it look like an hourglass. They were not submitted center-justified, I just figured it looked better this way. But I’ll talk to Maeve (our editor) to see if it would be better to align them on the left. Either way I am also thankful you didn’t submit any of your own poetry. That is because of your attitude. I am no expert in poetry. Just a blog owner trying to create something entertaining for our readers. I would have taken your suggestion/criticism in consideration even if you had put it in a friendly way. But hey, for each his own! anyways congrats dwt its a great initiative!! There is always someone who has to complain about good things. It just is too bad when we have to hear it. Don’t worry about those people, they are greatly outnumbered by the people whom actually appreciate what you’ve done. This was an awesome idea and a chance for people to submit their poetry. Yeah Daniel, I didn’t mean to sound like I was complaining about it, and I especially don’t agree with the “any good poet knows…” bit. That was a bit arrogant and weird. We appreciate you putting this together! Thanks for your votes everyone!!! The hourglass shape of my poem is great, don’t change a thing!!! It’s all about the individual’s expression and NOT one’s opinion!!! Its been a rough year for me, but this little competition has made my week! The typo is an expression of myself and my imperfections. Again Thanks to all voted for the Dipper it means a lot. Sorry if I sound a little exasperated. As a poet, I’m sick of seeing all poetry lumped in with the Hallmark material. The poems should definitely be displayed as they were submitted. Perhaps I could have been more tactful; the comment box does say “speak your mind.” So I did. Oops. There I go again, speaking my mind. Wow… the condescending tone never ends. He even threw in the quotation marks for extra sarcasm. Peter, I can’t wait to see your “poetry”. @Doug, no worries, I got the meaning of your comment. @Peter, publishing each poem as it was submitted would be practically impossible, given the time it would take to format the 150 entries individually. That is why it was not a matter of doing my “homework” before starting it. I needed to go with what was feasible. It was either all poems left aligned, or centered. I appreciate all feedback, though, so thanks for your comments and for reading the blog. @Daniel, That doesn’t cut it. You ask for submissions of people’s art but aren’t willing to take the time to do it justice? That hardly seems fair to either the submitters or to the spirit of your contest. What if e. e. cummings, after he finished spinning in his grave, came back from the dead and (anonymously) submitted this poem? Can you imagine his reaction upon seeing it centre justified? I know that if it had been me, I would have flipped my lid. If my tone is forceful, it’s because I think poetry is the most refined form of written art we have and deserves to be treated as such. As poets, we are taught to “make every word tell.” Please don’t undermine this by saying it’s too much work to present the poems as the were submitted. @Doug, if you google my name and poetry or poems, you’ll find my blog and other links to my work. I doubt it will be to your liking, but you and anyone else are welcome to comment. Sounds like peter likes to get the last word in, just wait its coming!!! I love rides by myself on mirrored lakes too!! Let’s get back to the inspirations of the poetry! Thank you so much for this poetry contest. I think, however, it was long overdue. That much is as clear as day. You should hold such poetry contests in the future too. Many more. And short story, plays, essays, and other types of contests as well. You have an excellent blog, which I read on a regular basis. You have no idea how much I appreciate all the hard work. I think all the poems posted so far are fabulous. I can’t find any faults at all, and really enjoyed the reading experience. Art is a treasure: it is like finding a pearl at the bottom of an ocean. What a pleasure when some people like yourself take time out from your hectic schedules to do something creative like this. It shows you have vision, a good heart and aesthetic sensitivity. To Archan Mehta: All I can say is “WoW”! You have the gift of encouragement. If Everyone had Someone like you in their life, this world would be at peace with itself. My poem (“untitled”) is about suicide. Enjoy. Very happy to have participated in this competition.